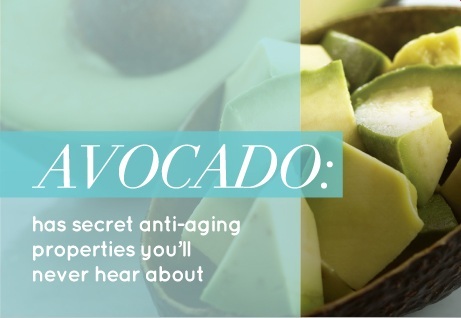 Avocado has secret anti-aging properties for healthy skin. Inside and out – avocados can give us something to really be excited about! Most people have probably already heard about the wonderful benefits of including avocado in their diets with all those healthy fats, fibre and bag loads of nutrients. What most people don’t know is that whether you put an avocado in your mouth, on your skin, or pack it in your first aid kit – avocados have some truly exciting benefits. Hidden inside those divine little ‘alligator pears’ are some wonderful anti-aging properties – oils that effectively fight against wrinkles, crow’s feet and skin discoloration – and are a powerful wound healer. An unusual little fruit in that it is packed full of healthy oils instead of carbohydrates, avocados are full of antioxidant, antibacterial and antifungal rich oils that can not only do wonders in the fight against aging – but also have great healing properties that help repair wounds faster, treat scarring, and even benefit a range of itchy skin conditions! 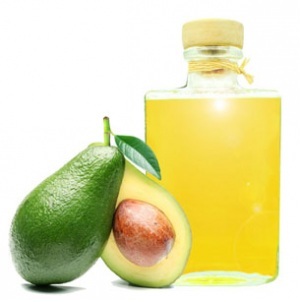 Dabbing a little avocado oil or fresh avocado on a wound will speed up recovery and protect your skin as it heals. 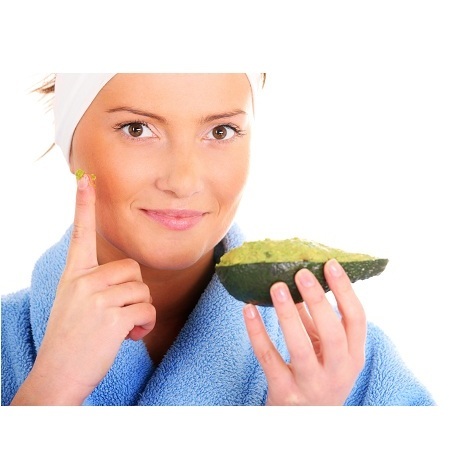 Avocado oil – is filled with antioxidants that banish free radicals that prevent healing – will restore your skin’s youthful moisture and keep it looking young and supple – is rich in moisturizing fatty acids easily absorbed by your skin. What’s more – in addition to these natural antibacterial and antifungal properties – avocados contain around twenty essential nutrients including from a huge dose of Potassium to Vitamin E, Magnesium, Calcium, Folic Acid, Iron, Boron and the B-Vitamins. All these nutrients, along with fatty acids – oleic and linoleic acid – help speed up and increase the repair and growth of new blood vessels and tissues, and boost collagen production. These fatty acids plump up your skin and smooth fine lines and wrinkles! Avocado Oil is great to keep on hand, whether you want to eat it or wear it. But Avocado Oil is thick, so if you’re going to use it as a moisturiser I recommend only using it at night or blending it with lighter oil, like coconut oil. 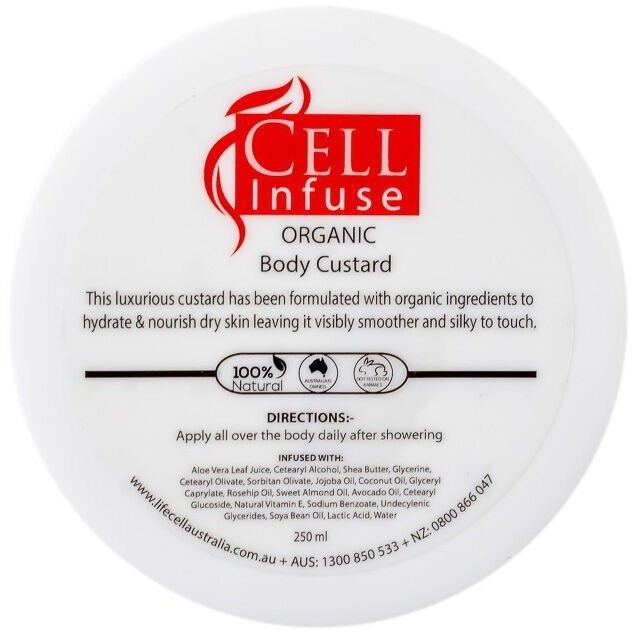 Another way to give your skin some avocado goodness is with our Cell Infuse Organic Body Custard with it’s high concentrations avocado oil and other beautiful organic ingredients – this lovely silky cream will not only sort out your problems with dry skin, it will help with those pesky signs of aging. A little bit goes a long way so use sparingly and enjoy the difference Cell Infuse Organic Body Custard makes and get excited about the humble avocado along the way! Previous post: A cure for your chocolate addiction? Eat Chocolate! As a keen fitness enthusiast I adore living health. Avocados are one of the best things you can eat. It took me a while to get into them, and they can quickly turn brown and be off putting. Using lemon juice reduces this. But, as I have a rather large appetite and can make short work of them!